Does Music Therapy Work with Special Needs Children? Music is a powerful therapy in helping special needs children grow and succeed in otherwise difficult areas. How can it help your child? Read on to find out how. If you have a child with a disability, you are likely actively looking for the best ways to help your child. Parents of special needs children such as Autism, Down Syndrome, Developmental Delays, or Speech Delays may have heard about music therapy in passing, gone to a conference presentation, or been referred for services. With so many options on how to help your unique child, it is difficult to decide if music therapy is the best use of your time and resources. 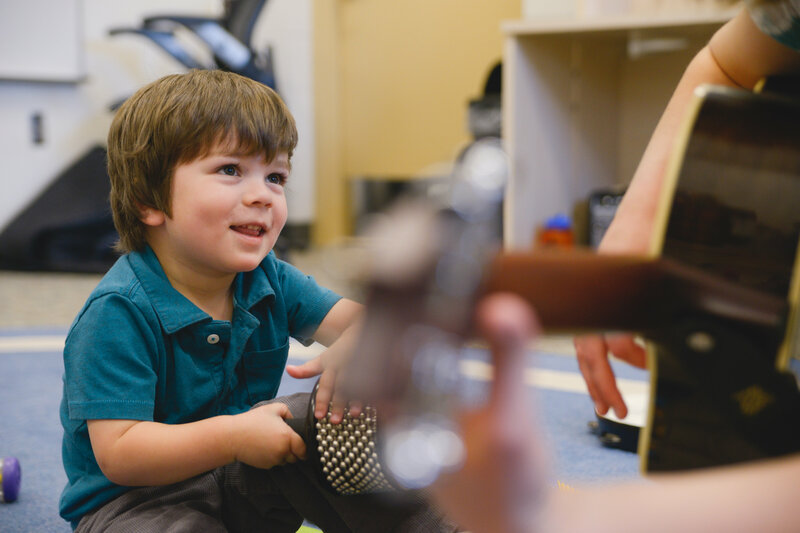 When considering music therapy for special needs children, think of a few key factors first. 1) Is your child motivated by music? 2) Is your child more engaged when music is present? 3) Does your child accomplish tasks or transitions more easily when facilitated by music? If your child is motivated by music to do things they may not otherwise do, then music therapy may be just what they need. We can use music to help special needs children learn concepts, develop needed motor skills, increase communication, improve social skills, and learn to better control their emotions. We can also help you as a parent learn how to use music in the home to help your unique child with everyday tasks. Transition songs, for example, may make a tremendous difference in helping a child move from one activity to the next with minimized tantrums. Task analysis songs that go through steps of how to wash hands or brush teeth, may help a child more readily acquire the skill. The possibilities of how to use music in the home are endless. If you feel like music is an integral part of your child’s life, bring them in for an assessment! Or better yet, come in for a FREE CONSULTATION. There’s no telling what your child may accomplish with the addition of this viable therapy. Come in and discover music therapy for yourself.